The exotic Bengals retains the striking wild appearance of their Asian Leopard Cat ancestors! Background Bengals are hybrid cat breeds. The Bengal Cats of today originated from the United States, though their wild ancestry comes from Asia. Common names include Bengal and Bengali. This breed's name was derived from the Asian Leopard Cat's scientific name, Felis bengalensis. It has no affiliation with the commonly known Bengal Tiger. Currently it is a rare breed that can be found in America and Europe. The creation of the Bengal breed began in 1963, when Jean Sugden, an American geneticist of Yuma, Arizona, crossed her female Asian Leopard Cat with a black short-haired domestic male in hopes of combining the wild physical characteristics of the Leopard Cat with the friendly disposition of the domestic cat. Though matings between domestic and wild cats usually produce only infertile offspring, the females from this cross were fertile. A female of this litter, named Kinkin, was bred with her father, and produced a litter of both plain and spotted kittens. This breeding project could have been the beginning of the Bengal breed, but it was abandoned after the second mating, when Mrs. Sugden was widowed. However, later in1973, another geneticist, Dr. Willard Centerwall of California, began a new breeding project with Leopard Cats and short-haired domestic cats in order to determine the Leaped Cat's resistance to feline leukemia. He gave eight females to Jean Sugden, now Jean Mill, after her remarriage, and she used them to start a new breeding program. In 1983 the International Cat Association (TICA) accepted the first Bengal for registry. His name was "Millwood Finally Found". The Cat Fanciers' Association (CFA) currently does not recognize the Bengal. Many different domestic breeds have been used in breeding programs for the Bengal, involving both natural breed cats and other hybrids, including the Siamese, Burmese, Egyptian Mau, Ocicat, Abyssinian, Bombay, American Shorthair, and British Shorthair. Description The Bengal is a large breed, weighing between 7 and 20 pounds. It has a long, well-muscled and powerful body. The legs and tail are medium in length and the tail tapers to a rounded black tip. The head is large and rounded with a large, broad nose and large rounded ears. The eyes are large, oval-shaped, and wide set. The Bengal's life span is approximately 15 years. The Bengal's fur is short and fine. The coat is thick and extremely soft. The coat is generally covered in solid spots, even on the belly, but some specimens have dark rosettes, or two-toned spots, instead. 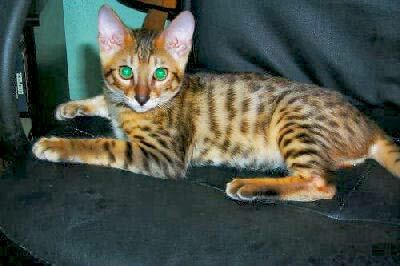 Bengals can also have a "marbled" coat, which means the pattern flows horizontally in a swirl. The color forms include Leopard (spotted tabby), Marble, Snow Leopard (ivory background with contrasting spots), Snow Marble, Sorrel (Golden), and Mink. Care and Feeding The Bengal requires no special diet. Housing Your Cat This is a very active breed that needs a yard and plenty of room to run, play, and hunt. Kittens can be destructive, so preparations should be made to protect furniture and other items in the house. A variety of toys and a scratching post are also helpful in decreasing their destructive behaviors. Maintenance Bengals need a weekly brushing and combing. Social Behaviors This breed is very social. It enjoys being around people, dogs, and other cats. This breed should not be left alone for long periods of time because it is likely to find furniture, curtains, or other items to shred in its boredom. If it is going to be left alone frequently, having another cat can help keep it occupied. However, the Bengal can also become jealous if it thinks another pet is getting more attention than it. Activities As mentioned previously, this is a very active breed that enjoys running, hunting, and playing with humans, cats, and other animals. These cats enjoy interactive play such as fetch or hide and seek, and they can learn to walk on a leash. They also love water. They will readily join their human companions in the family pool. Breeding/Reproduction Most males are infertile, though the occasional male is able to reproduce. Females are fertile. The 1st through 3rd generations of Bengals are considered "filial", and are used for breeding and specialized pet environments. The 4th and later generations are considered domestic and can be shown and registered. Common Health Problems The Bengal is a hardy breed. No special health problems have been documented. Availability This is a rare breed, but breeders are available on the internet and locally. Prices range from $300 for an adult pet quality cat to $650-$800 for a pet quality kitten to $1200-$2000 for a show quality kitten. Hi !! do you still have them ? where is your lacate? is this information still available? Where are you located? We are looking for a bengal kitten to join our family. My husband and I are teachers and we have two young children. Please let me know if you still have your cat for a great home. I have been looking to purchace one and would love to talk to you if you still have yours. Thanks. I am interestedonly if this isn't a joke. I am very serious about this inquiry. Two Stunning F3 BOY GIRL Bengal only available special pet homes. My mom is a big wonderful girls imported from Germany and dad at the lowest place Woodstock Manchado impressive boy imported from the USA. One silver and one black spot brown black spot. These kittens are already very out going and show beautiful contrasting coats with large individual sites. Both kittens are excellent examples of the breed, they will be fully vaccinated Tica registered and micro-chipped. I was wondering if you still have the Bengal kittens that are available. I am interested. I look forward to hearing from you. Thanks. Hi, o am really interested in two of them if you have them I am very serious about and hope this isn't a Joke.